I was actually looking into this home laser engraver thinking, well if I use this project to get it, I could engrave future POY if it works well, the stamps aren’t as clean and uniform as engraving, but definitely cheaper and more portable to go between various makers. As for the COY, I’m going to shelve it for the time being, doesn’t seem like enough people are interested in an actual CPS cob to make it worth the time and energy/clam shells. As for the stamp vs engraver/ getting one for future use, sounds like a good idea for another thread. While I don't have a goat, I'm sure any goat would love a cob. So, the COY will be Goat Approved? Now you need two stamps. Goats approve of things by eating them, not stamping them. 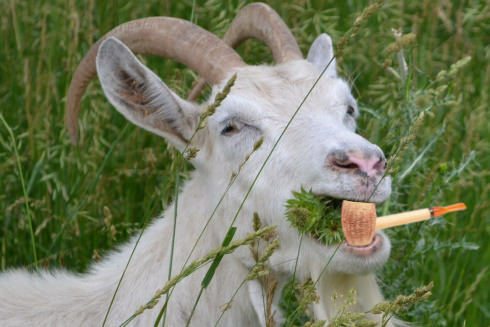 Therefore, each COY 2019 will be eaten by a goat. JohnnyMcPiperson wrote: Well the minimum order to get MM to engrave cobs for us is 100 pipes... so that’s probably not going to happen... I’ll have to keep working on a plan B.
I own one of these. It works ok, especially for the price point. Not super fine, but pretty impressive. I am interested. If there were but 2 CPS COY 2019 that would GUARANTEE at least 2 for 2020. We could do rad stuff with just us two for a year of four. Know what I'm saying? Green Cob Wardens. Blue hued barrel bowels with 4.5" matching stems. A CoBing, if you will. Abandon not the concept, friend. Sleep on it for a few months. Hey! Remember that movie The Planet of the Apes? It's early in and they've crash and are walking forever through the desert and they finally find some sort of small grass weed plant looking thing. Chuck Heston says, "Where there's one; there's more." Or something similar. The google machine isn't being very helpful right now on this item. 1. Let's do the COY. You and I at a minimum. 'round here we call that, fun. 2. You go and find that quote from the flick. If I remember it only 50% right; it's still perfect here. 3. If you build it; they will come. I don't know how to fix it. coco? can u fix it? The town drunk in a place I lived one summer was named Coy. He passed out in our driveway one morning and I almost backed over him. I’m still stunned that you people couldn’t successfully purchase the required quantity of cob pipes and then ship them them out to people that had paid you for them. There's been at least 2 already. I'd say this might be #3... or #4, not 100% sure. Alas-- as for me, I have not. But I would. There's a young lady in Alabama who has a Facebook page called “Candy's Artistic Cobs”. She takes commissions to hand paint designs on the cob pipe of your choice, and some of her work looks really good. I've thought about having her make me a Grateful Dead themed cob. Last edited by Adam Z on Sat Jan 26, 2019 12:20 pm, edited 1 time in total. That is a splendid idea. I'll sponsor one for Jocose.